Hileman Silver Jewelry creates earrings in many shapes and sizes from small stud size earrings for everyday wear to large statement earrings for that special event. Our earrings can be inlaid with almost all the stones you see in any of our rings, pendants, bracelets, etc. so don't feel limited to only the stones shown in the earrings. Some of the inlay earrigns shown may have already sold. If sold, we will contact you after ordering to see if you would like to wait 3 to 4 weeks for us to create a matching pair for you. Laboratory Grown Opal and Black Onyx Earring Pendant Set Silver earrings inlaid with sugilite, opal and chrysoprase. Silver inlaid Australian opal and sugilite hoop earrings. Laboratory created opal and black onyx earring and pendant set in sterling silver. 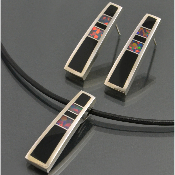 The multi-color lab opal in this inlay pendant and earring set is outstanding! 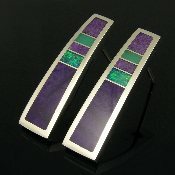 Sterling silver tapered earrings inlaid with sugilite, Australian opal and chrysoprase by Mark Hileman. Great piece of blue green Australian opal in middle with sugilite on top and bottom. 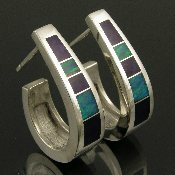 Sterling silver tapered "J hoop" earrings inlaid with Australian opal and sugilite by Mark Hileman. Nice blue green Australian opal and deep purple sugilite inlay.